And, it turns out I was very lucky to have had a glimpse of it open. This is the feature in question, as I saw it last year. 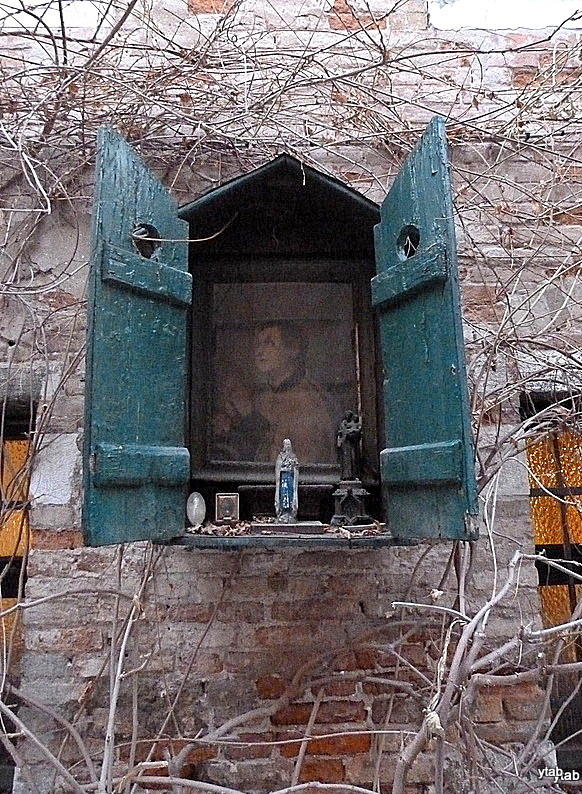 When I published that post, I was lucky to have an expert on the shrines of Venice leave a comment. Annie had poked her camera through the vines that were growing over the shrine to capture this photo. You can see there have been some changes to what was inside the shrine in 2010, and what I saw in 2013. And finally, here is what I found when I went looking in 2014. I wonder if we’ll ever see those doors open again? What a fascinating post Y. I just love Annie’s blog. The vine looks to be wisteria. Same here, Susie, I really admire Annie’s research and writing. I hope the vine will be in bloom next spring, I’ll be sure to report back. So interesting. I find it awesome. Thank You showing it. Now, I’ll be looking again in May, and I’ll report on what I find. Thank you for dropping by. I really enjoy your blog, very much. You must be heading towards winter. How cold does it get? Thank You. Yes indeed we are heading towards winter. We had few days zero temperatures. Before it the weather was about 20 degrees. For today max is said to be about 10 only. To have zero in September is not normal! We lived in northern Canada before moving to Australia. I can’t understand how we coped with such dramatic temperatures in the winter, and giant mosquitoes in the summer! That is amazing. 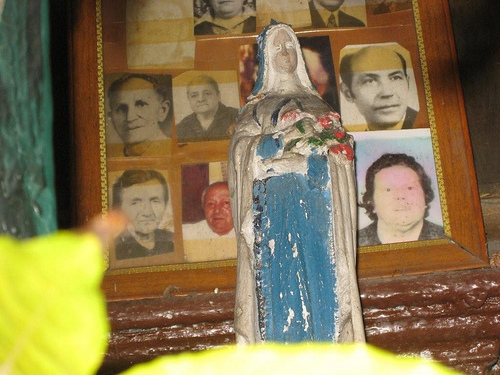 In a way it reminds me a bit of the photos that women hold up in Buones Aires every Thursday of ‘the missing ones’. A most moving experience. The mothers/wives stand there, every year every thursday. I know it is different to the shrines in Venice! Oh, boy, that would be very touching, Gerard. I just can’t imagine how those poor women must feel. I haven’t seen the women with the signs in person but have seen them on the news and in documentaries. Let’s see what I might find next spring, Laurie. I can’t wait to see what you find in May. I think you’re right and that the family who took care of it is gone. So poignant. I’m curious about the vine too and wonder if it ever blooms? May would be a good time to see if there are blossoms, or only leaves, Annie. There’s always an ongoing story. If you have visited Campiello del Curnis already, please let me know. 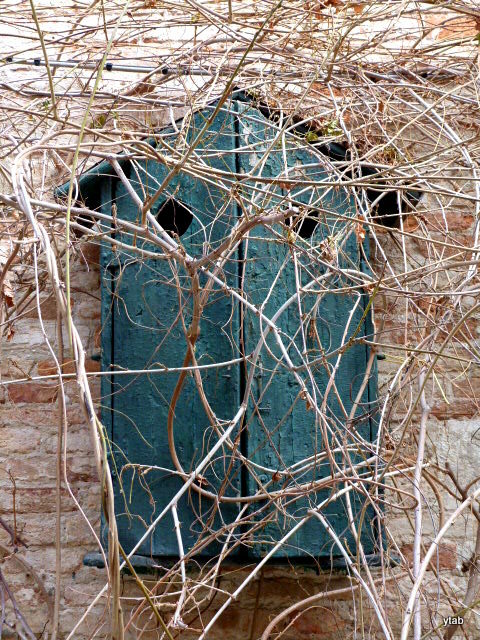 if you haven’t, it’s another place that I would love to know what it looks like in spring when the vine is active. What a shame to have it closed and grown over. By the looks of the photo from Annie’s site, it may have been a particular family who took care of it, and maybe they’re all gone, one way or another. I’ll try to get to it in May, and see if it’s open or closed.